U-PICK COLOR!!! 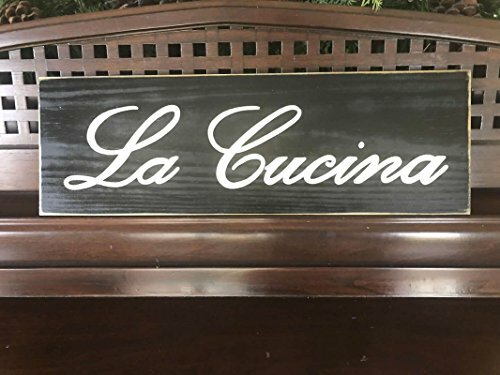 Here's a great CUSTOM wood sign for your Italian - Tuscany styled kitchen/dining area that reads: "La Cucina" Italian for "the kitchen". This GREAT sign is painted and antiqued to give it that chic & shabby, Italian Country look. Color featured is black w/ creamy antique white lettering. Other color options include: sage, barn red, burgundy red, cobalt blue, gray, orange, navy, sand/taupe, real red, coffee bean brown, mustard yellow, creamy antiqued white, olive green, girly pink, pure cotton white or hunter green. There are 2 sawtooth hooks included for hanging ease or it can be propped up on a shelf/ledge. Signs are unfinished on the backside. Sign measures 17" x 5 1/2". If you have any questions about this product by Shabby-Sign-Shoppe, contact us by completing and submitting the form below. If you are looking for a specif part number, please include it with your message.